Tomato late blight is caused by the oomycete pathogen Phytophthora infestans (P. infestans). The pathogen is best known for causing the devastating Irish potato famine of the 1840s, which killed over a million people and caused another million to leave the country. Solanaceous plants such as potato, tomato, petunia, and nightshade, but the disease is economically important mainly in potato and tomato. 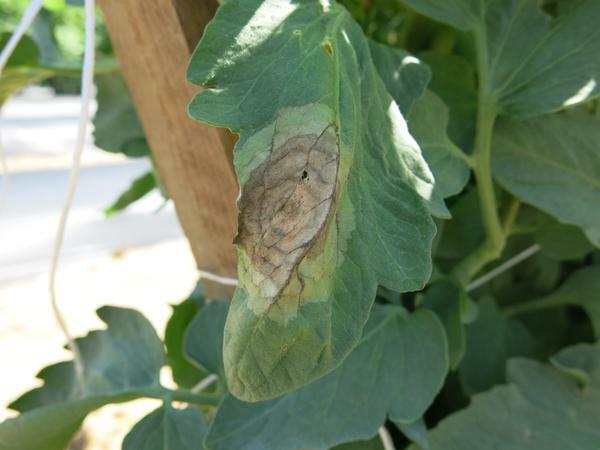 Learn more about tomato late blight. Integrated Pest Management (IPM) is a sustainable approach to managing pests that combines multiple approaches including prevention, avoidance, pest monitoring and suppression in a manner that minimizes public health, economic, and environmental risk. IPM serves as a framework to provide an effective, comprehensive, low-risk approach to protect people and resources from pests. Ultimately, the goal with an IPM program is to help stakeholders deal with pests—insects, plant diseases, weeds, and more—with methods that reduce risks to public health and the environmental while saving money. The North Carolina Extension IPM Program serves as a focal point for team building, communication and stakeholder participation in integrated pest management (IPM) within the state. Program goals include promoting effective and economical management of pests, reducing risks to human health from pests and pest management practices, and minimizing environmental effects through the adoption of IPM on a variety of crops and settings in North Carolina. These goals are achieved by the timely delivery of IPM technology and research information to stakeholders in all regions of the state. Leadership of the Extension IPM Program in North Carolina is provided by an IPM Coordinator (designated by the Director of the North Carolina Cooperative Extension Service), an established Advisory Board, and working groups. Dr. Danesha Seth Carley, the current IPM Coordinator, accepted the NC IPM coordinator position in 2013. The Extension IPM Coordinator involves faculty and staff from North Carolina State University and North Carolina A&T State University in IPM activities across the state, communicates program successes, and maintains stakeholder input via the Advisory Board and the IPM portal, as well as multiple training sessions and meetings. The Advisory Board provides advice to the Extension IPM Coordinator regarding the direction of the IPM program in the state. It is composed of a wide variety of IPM stakeholders, including North Carolina State University and North Carolina A&T State University faculty, non-governmental agencies, environmentalists, North Carolina Department of Agriculture & Consumer Services personnel, farmers and agricultural consultants. The North Carolina Extension IPM Program focuses on delivering IPM content to our stakeholders and community members through a variety of activities. The primary activities include information delivery, pest monitoring and data managment, evaluation and needs assessment tools development, and programs to magnify statewide IPM impacts. The Extension IPM Program is a cooperative effort of the USDA NIFA, North Carolina Cooperative Extension Service, North Carolina State University, and North Carolina A&T State University. It also works in partnership with the Southern IPM Center, located at North Carolina State University in Raleigh, and acts to promote IPM in North Carolina and the Southern United States. Funding for the North Carolina Extension IPM Program is provided by competitive grants from the U.S. Department of Agriculture’s National Institute of Food and Agriculture (NIFA).